“I’m Frond Of You” is a HHC Facebook custom from February 2018. There were three polishes from CbL that month and I bought two of them. I’m definitely going to post the other one tomorrow. I used two coats for full opacity. If you’ve got longer and/or bigger nails than mine you’re going to need three coats The drying time is really good. I placed a black heart in topcoat randomly on each nail and made little dots from the heart and up to the base of each nail. Then I topcoated it all again. Here’s the final result including two layers of topcoat. The photo is taken with flash because I hadn’t got any sun available. This is a daylight picture, but still no sun. This polish is really sparkly. And here’s “I’m Frond Of You” alone; this is two coats and no topcoat. I like this polish, it’s super sparkly and pretty. “I’m Frond Of You” was limited edition and is no longer available. 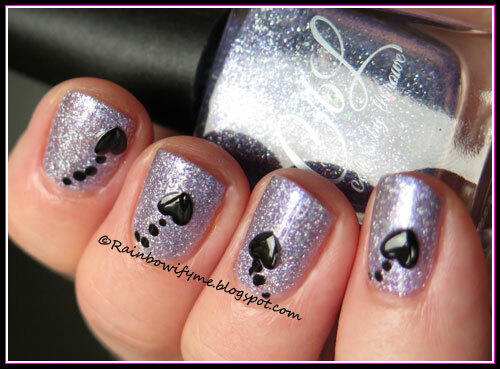 Morgan Taylor ~ Holo Lover!